Let’s hear it for Grandma Camp! All the moms around the world are yelling! ME! Sign my kids up! Do your parents long to get to know your children better? Do you have precious memories of spending time with your grandparents as a child? 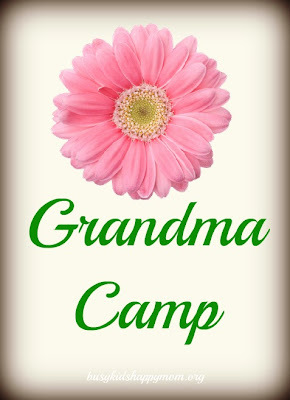 Then Grandma (or Grandparent) Camp may be for you. 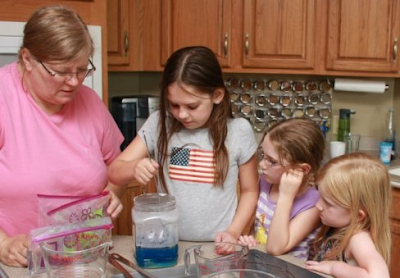 Grandma Camp Tips: Get parent approval before you begin planning. Seek out low-cost transportation options if your grandchild lives far away. Figure out your plan (see below) while considering your grandchild’s age, personality, and age. A great mix of crafts and adventures is sure to be a success. 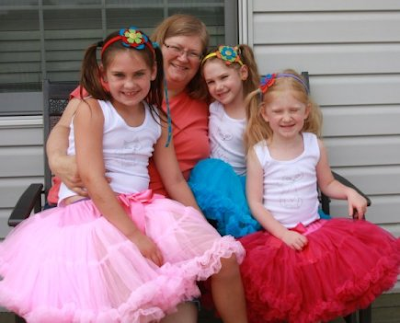 I love creative women who love their grandchildren and inspire other women. This was written by my friend Tori. She also shared how to use a Rainbow Loom with a Preschooler. Take it away Tori! “Grandma Camp” came from an idea my mom (Grandma Lisa) had for awhile as a way to spend some fun time with her grandchildren. We live several states apart so time together is precious. We started in the Summer of 2011 and have continued it ever since. Adding more and more children as our family has grown. Grandma Lisa planned activities to go along with the theme for each day of the week. At the start of camp, the campers picked fun camp names and agreed on a set of camp rules, such as “Treat fellow campers kindly” and “Raise your hand in a fist to ask for the restroom.” Camp started at 9am and went to about 12:30-1pm. It included a snack, which sometimes the campers helped prepare. Grandma Lisa had three campers, her three granddaughters – Maddie (8), Katie (5) and Marissa (5). There are two grandsons who will also be included in camp, Macager (3) and Caleb (2), as they get older and are able to participate in the activities. For camp, Grandma Lisa was called Dragonfly, Maddie chose Hummingbird, Katie was Bunny and Marissa was Lemonade Squirrel. 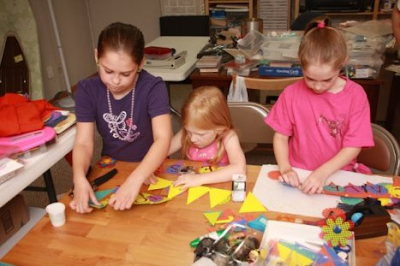 The girls made cute flower headbands and each decorated 4 shirts with iron-on bling designs. The headbands were made with foam coasters cut with a die-cue machine and oversize brads. After they were done creating their fashions, the girls put on a fashion show for their moms & brothers. Grandma Lisa taught the girls about rocks & minerals. First, they set up a rock tumbler (which took several days to complete) to polish rough rocks into smooth & pretty treasures. Second, they started a crystal experiment where each girl grew colorful crystals. Third, they sorted and broke geodes with a hammer. For snack, they made “No-Bake chocolate cookies” which were supposed to look like a rocks and turned out to be a favorite snack of the week. Grandma Lisa took the campers out all day long! They started with the free summer movies, then went onto the Dollar Store (for a secret shopping trip), followed by lunch, the story time at the library, and finally the playground. By the end of the day, all three girls & Grandma Lisa were wiped out! The secret- shopping trip was for supplies for a surprise birthday party. Summer is a big time for birthdays in our family. Grandma Lisa and the girls planned to host it on Saturday for their moms & brothers. It included balloons, decorations, party blowers, silly string and a pinata they stuffed themselves! To start the morning off the girls got to play with lots of fun craft supplies: ribbons and trims, paint markers, faux jewels and pearls, brads, and glue dots. They each decorated a piggy banks, jeweled flower clips, and headbands. Then they used cardstock, brads, stamps, markers and gems to make birthday cards and a birthday banner for the surprise party. They also cut & embossed metal flowers to decorate pails as gifts for their moms. Snack for the day was “Hodge Podge.” Each girl picked 3 snack items to dump in a bowl & mix together for a crazy use-what’s-in-the-pantry trail mix. The used M&Ms, peanut M&Ms, gummy bears, goldfish, animals crackers, nuts, Rice Krispies, raisins and Craisins. The final day of camp was a time to review and finish all activities they had done through the week. They rinsed and reloaded the rock tumbler one final time, checked on their crystals, and worked more on their crafts (birthday cards, banner, and flower clips for their moms). At the end of camp, they put all their projects & creations on a table to display all they had done through the week. Grandma Lisa says the girls were surprisingly well behaved throughout the week…and it definitely helped that no moms or dads were allowed at camp! On the first day, Maddie described the iron-on bling as being “FABULOUS” and all week it became the girls’ favorite word. The girls were especially interested in fashion. They wanted to have extra fabric and ribbon from Grandma Lisa’s craft room to be able to create and design their own doll dresses. They also really liked making cards and spent much more time on the cards than originally planned. Grandma Lisa has been planning the camp for a while now, so she has had time to shop sales and gather the materials for all the activities — not to mention she has a considerable craft room stash from which to pull tools and supplies! Biggest tip: plan many activities and be flexible. Some activities she thought would be quick, the girls wanted to spend lots of time on (like making cards). While, some activities did not hold their attention as well and were shortened as the girls lost interest. Overall, it was a HUGE success! 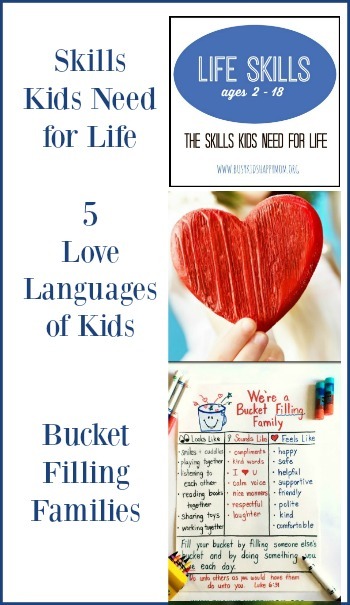 Follow Kristen on Facebook, Pinterest, and Busy Kids Happy Mom. What a fun idea!! I have a friend whose mom plans “Hunting” days and other fun activites throughout the year since they live nearby. I like this camp idea too! This is a wonderful idea.They will have many special memories of Grandma Lisa. 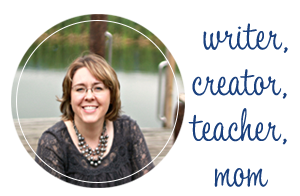 I was so inspired by this post and hope that maybe I could even do a Mom Camp someday! Following from the Tuesday hop. How adorable is this? I’m so impressed & can’t wait to do this when I have more grandchildren! Thanks so much for linking it up to Fab Friday! Just saw this on Pinterest last night. Already have activities planned and invitation printed. Am so excited. Can hardly wait. I only have one grand-daughter and 2 grandsons, so am planning Grandma camp for each of them separately because they are siblings. Coming for a week alone is a highlight. thanks so much for sharing this terrific idea!! I too have a Camp Narnie (my grandmother name) every year for my four granddaughters. We try to do it on the weekend of the GA/FL football game because PawPaw is not here. We start with dinner out on Friday night and then get up on Saturday morning and go downstairs to the Big Room in our basement. They open their gift bags with stuff from the dollar store. We had learned to sew pillow cases (and use an iron :)). We have gone to a tea room and then to American Girl store. This last one we went to a Laser place. They really enjoyed that. Sadly, the oldest will be in college next year and I am running out of ideas for crafts. Their ages now are 17, 15, 13 and 11. Any suggestions for next year will be appreciated. Susan! What a fun grandma you are! I love Camp Narnie! For extra ideas – I’m all over Pinterest! I’ve started a board called “cousins” that’s really just a place I keep track of fun ideas to do with my nieces when they come to town. 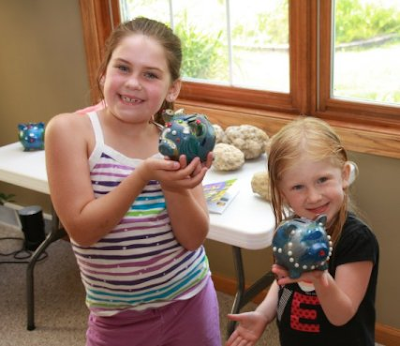 http://pinterest.com/kedesigns/cousins/ I think your girls are ready to go to museums, make your own pottery, or go for a hike! Whatever you do, I’m sure it will be fun. Keep building those memories! My grandma name is Reera so we have CampReera. We live in the mountains on a 40 acre farm. We made our own slip and slide and this year its going to be even bigger. We have campfires and since we are putting in new gardens they will be making a scarecrow and a fence out of woven vines. We have trimmed on of our old apple trees to be designated as the climbing trees. We will sleep in tents or on the front porch. No electronic devises or tv permitted.